Wondering what New Seasons was like back in 2006 as it ramped up to take the Portland area by storm? Or how Hopworks Urban Brewery’s pubs can afford to have custom furniture made of old growth wood? Or why Portland Fashion Week staked its claim on eco-fashion? A new archive of candid audio interviews with local Portland entrepreneurs, innovators, and policy-makers has the answers. With more than 140 interviews, and the intention to add more each year, the public online archive at Portland State University Library represents the hotbed that is Portland’s sustainable economy. The Sustainability History Project features candid interviews with experts in the building, farming, fashion, brewing, food, transportation, and—get this—human burial industries, among many others. “It’s the only thing like it,” said Joshua Binus, a Portland State University Capstone instructor who launched the project in 2006 with his students. “We wanted to get past the veneer of green marketing and see how people in the Northwest were actually incorporating sustainability strategies into their businesses and policies,” Binus said. Chris Cone, production designer for Portland Fashion Week, describes how Portland embraced the concept of sustainability to produce a week of shows dedicated to eco-fashion that drew audiences from around the world. There’s also a fairly extensive set of interviews from 2013 with people working to make our public schools healthier, happier places for Portland’s children. Like the founders of Schoolyard Farms—an urban farm at Candy Lane Elementary that runs a CSA and uses the proceeds to fund food education programs at the school. Or Kristine Garnero Obbink, a nutritionist with Portland Public Schools, who helped introduce salad bars in school cafeterias: “We knew if kids could help themselves to as much or as little fruits and vegetables as they wanted, then they tended to eat them,” she said. More than 200 students at Portland State University have participated in the project over the past eight years. Binus says that for many students, the experience has been transformational. 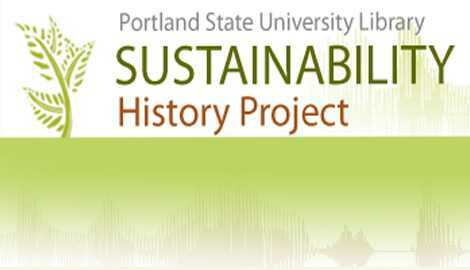 Listen to interviews for yourself from the Sustainability History Project at the PSU Library Special Collections and University Archives website. It’s free and publically accessible. PSU students interview local entrepreneurs and innovators on how they implement sustainability strategies in business, policy, and daily life.